This is the enhanced version of ISM Onboard the ONE. Very revealing of low-level ambient and spatial cues with exacting focus. Vivid, lifelike sound within a large, expansive soundstage. This interconnect has Isolated Shield Matrix® and Floating Ground Station® technologies within ISM Onboard Capsule™. It has RSC® SA-OF8N® copper conductors with a natural fiber core, PTFE dieletric throughout ; Aero-PE® primary dielectric throughout and Anti-Corrosion coated copper shield. 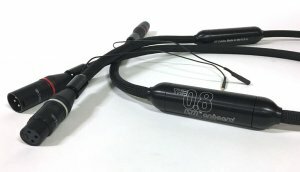 The ISM Onboard The 0.8 audio cables use SA-OF8N copper conductors. (Super-Annealed, Oxygen-Free, Mono-Crystal, Frequency-Tuned, 8-Nines-99.999999% copper conductors) All cables have: hand-polished conductors and are handmade per order in Oregon, USA. The ISM Onboard The 0.8 is lifetime guaranteed. The cables arrive in a Mylar static bag, enclosed in a custom embroidered velvet bag, inside a TARA Labs box.